Singapore equities began the week on a dull note after Apec leaders, for the first time, failed to produce a joint communique at their recently concluded summit amid trade tensions between the United States and China. The benchmark Straits Times Index slid 18.53 points, or 0.6 per cent, to 3,065.07 points. Losers outnumbered gainers 213 to 172, with about 1.01 billion shares worth $703.3 million changing hands. CMC market analyst Margaret Yang said: "The Singapore market gave up most of last Friday's gain, as the tensions during the Apec (Asia-Pacific Economic Cooperation) summit underscored uncertainties that overshadowed prospects for the upcoming G-20 meeting, in which the market previously anticipated positive breakthroughs in the US-China trade relationship." In addition, local banks fell on weaker prospects for rising interest rates, which are key drivers of banks' profits over the past quarters, she added. OCBC Bank lost seven cents, or 0.6 per cent, to $11.09; United Overseas Bank fell 15 cents, or 0.6 per cent, to $24.25; and DBS Group Holdings slipped 12 cents, or 0.5 per cent, to $23.20. Singapore Exchange market strategist Geoff Howie noted that the three local banks led the share buyback tally last week, with their buybacks contributing 90 per cent of the week's total buyback consideration. In particular, DBS bought back 1.4 million shares for a total consideration of about $32.88 million, or $23.49 apiece. 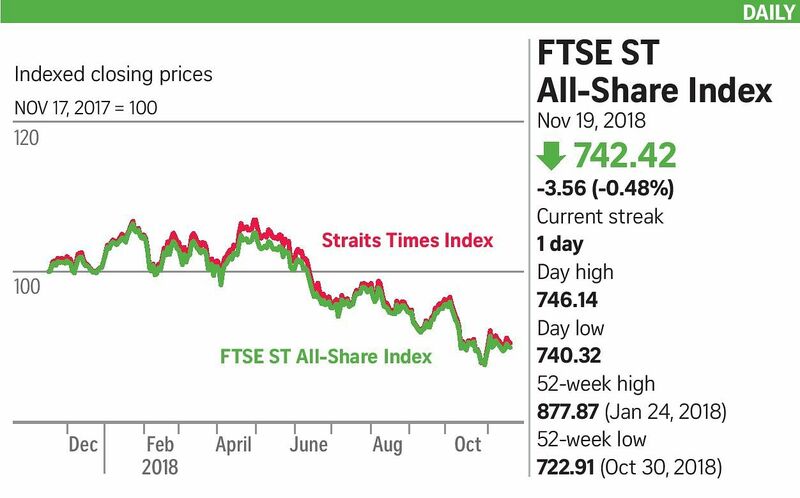 Besides Jardine Matheson Holdings and Jardine Strategic Holdings, which shed 2.9 per cent each, also dragging down the index was ST Engineering, which dipped five cents, or 1.4 per cent, to close at $3.50. ST Engineering had posted a 5 per cent increase in third-quarter net profit to $134.6 million last week, on the back of improved bottom line contributions from its aerospace, electronics and land systems divisions. Multilevel marketing firm Best World International bucked the trend to rise seven cents, or 3.3 per cent, to close at $2.18. Despite Procurri Corp's announcing on Sunday that it intends to make its US-based joint venture Rockland Congruity its wholly owned subsidiary in a US$22 million (S$30 million) acquisition, shares of the life-cycle services and data equipment provider fell 0.5 cent, or 1.7 per cent, to close at 28.5 cents yesterday.